At PensionBee, we talk about our values a lot. We have five values, that we chose in a session nearly three years ago, with the then (much smaller!) team. The values we chose then, and still live and work by today, are honesty, innovation, love, quality and simplicity. Love was originally chosen as a value, because it was the word that best reflected the way we feel about our customers. All our customers are assigned a personal BeeKeeper to look after them throughout their journey with us. It was a conscious decision that was made before we even had our first customers. We wanted to make sure they never felt like a number. Our team of BeeKeepers has grown a lot since the early days, but the one-to-one support they offer our customers has remained. When we hire into that team, we look for people that we believe will not just be able to show our customers the love they deserve but will really want to. I think they do a pretty great job of it! Our love for our customers is also present in the way our product has evolved. We love receiving feedback! It’s always great to receive positive feedback, and to hear of the amazing things our team are doing to help our customers. But we also really value the constructive feedback, that tells us where we could be doing better or where there’s something missing that our customers really want. 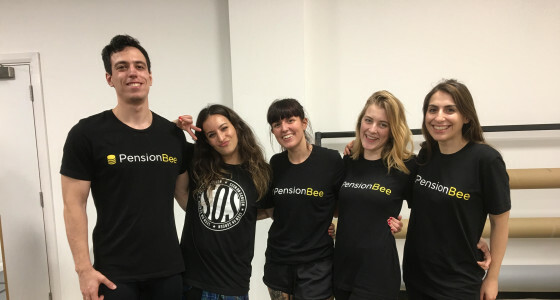 Our mission at PensionBee is to help people on their way towards a happy retirement and having our customers tell us how we can do that for them is something that we feel so grateful for. There’s a lot of love in our team! I feel incredibly lucky to work in a team that’s full of such compassionate, supportive people, and the small things can sometimes make the biggest difference. Members of the team will announce on our Slack channel when they have a bit of spare time, so that their colleagues know they’re available to help if someone needs it. There are also regular public displays of gratitude between employees - we’re constantly showered with chocolates from colleagues, thanking their team-mates for holding the fort while they’ve been away enjoying a holiday. We’re a team that really appreciates each other. We also, of course, have regular socials, whether it’s drinks at one of our local haunts or a ping-pong tournament in our kitchen. There are many great friendships that have been forged at PensionBee, and there’s no denying it makes coming to work even better when you come to work with friends. One of my favourite ways that we show our love for the community is through our involvement in the ‘Together at Christmas’ campaign run by Better Bankside. We host a collection box in the office, where we gather items that are then donated to homeless, elderly and vulnerable people in the Southwark area. Before handing them over, we host a gift-wrapping evening, where we gather the donations into bundles and wrap them up ready for gifting. It’s a lovely, festive evening with Christmas music and high spirits all round. It’s important that we give back to our local community, and the ‘Together at Christmas’ campaign is such a worthy cause, but doing something like this also has a really positive impact on the office. The team love it and we’re already looking forward to supporting the campaign again next year – at least I know I am! One of the earliest requests we had from our customers was for an ethical investment option. We listened, added the Future World plan to our platform last year, and it’s proving a popular choice. As well as being what customers wanted, having an ethical option was also something that the team internally felt passionately about. We’ve also recently added a Shariah plan to offer an alternative ethical option – something else that our customers had asked for. Businesses are in the privileged position of being able to make a real impact on the world by the decisions they make, which is one of the reasons we’re also strong advocates for moving away from the wasteful paper-based transfer systems used by some older pension providers. We have our own company policy not to physically post anything to a customer unless they’ve explicitly requested it – and that happens rarely. We dream of a world where we can live in a paper-free office, and we’re pushing the industry to ensure that one day we’ll get there. Change is a strong theme at PensionBee, and importantly the need not to be afraid of it. We’re constantly striving to improve the way that we do things and the experience that we give our customers. This is often achieved through innovation, which will be the next value I’ll be talking about here on the PensionBee blog – coming soon!